Advantages: High quality master and casting. Conclusion: An ideal finishing touch for P-38 fans. Ultracast, the Canadian based producer of fine resin products has recently turned its attentions toward the Lockheed P-38 Lightning and have produced six new wheel and two seat sets. 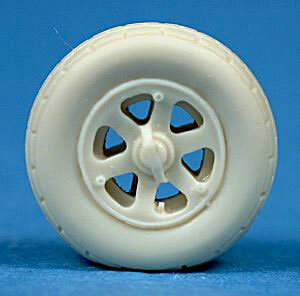 Their 48219 set provides you with a pair of uncovered mains wheels and nose wheel wearing block tread tyres. If you are a fan of the P-38 and have built the Hasegawa and Academy 1/48 scale kits you will be aware of the shortcomings of both makers’ wheels. The Hasegawa nose wheel, apart from having the spokes cast with webs between them, have two great ejection pin scars on their tyres which are a real pain to fill and sand. The Academy kit’s nose wheel is similarly moulded as are the mains and all three are shod with “rubber tyres” which are very difficult to paint and weather. This new series of resin P-38 wheels from Ultracast address all of these problems. The parts are crisply cast with abundant detail on the rims that includes minute inflation valve stem as well as the heads of the securing bolts. If you look hard at the outer faces of the mains you can make out the internal strengthening ribs as well as the detail of the brakes. The nose wheel has been cast so that you can see daylight between the spokes, just like the one-to-one-scale ones were like. This set is shod with block tread tyres. The tread appears to be representational of brand new tyres so those of you who want to model a “used” P-38 might want to reduce the tread with sandpaper. My sample wheels and tyres are perfectly cast with no pinholes whatsoever and preparing them for use will only take a few minutes use of a razor saw and sandpaper. Once the casting plug has been removed, a quick tidy up with a file will introduce a “flat spot” for your scale P-38 to rest on. 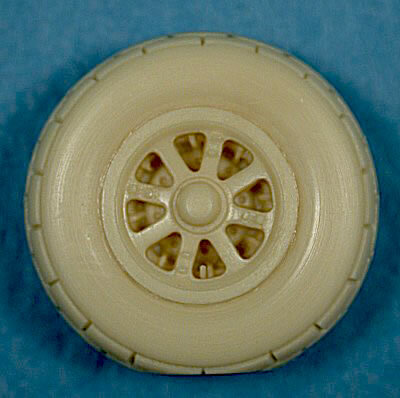 The two “blocks” on the bottom of the tyres have been cast so that they appear elongated by the weight of the aircraft’s weight and thankfully, the walls have not been excessively bulged. Examination of images of the P-38 show that it wore several different styles of tyres, smooth (no tread at all), block tread and diamond tread and indeed a mixture of two block or diamond tread mains and a different nose wheel tyre so as always, check your reference when it comes to P-38 tyres. P-38 kits in 1/48 scale and well worth the $9.95 Canadian Dollars that Ultracast are asking for them as far as I am concerned. Thanks to Ultracast for the review sample.